Walking around in Ha Noi, Viet Nam’s capital, you can feel boundless energy everywhere. People whiz by on scooters, buy and sell everything from phones to food in the countless small shops, and run to and fro to get to school or work. Viet Nam is young, growing, and anything feels possible. It wasn’t always thus. A mere 30 years ago, the country was one of the poorest in the world. How did this southeast Asian nation grow to become a middle-income country? When the 20-year Viet Nam War ended in 1975, Viet Nam’s economy was one of the poorest in the world, and growth under the government’s subsequent five-year central plans was anaemic. By the mid-1980s, per capita GDP was stuck between $200 and $300. But then something changed. In 1986, the government introduced “Đổi Mới”, a series of economic and political reforms, and steered the country to becoming a “socialist-oriented market economy”. Today, Viet Nam is one of the stars of the emerging markets universe. Its economic growth of 6-7% rivals China, and it exports are worth as much as the total value of its GDP. Anything from Nike sportswear to Samsung smartphones are manufactured in this ASEAN nation. Such is the success of the country, Sheng Lu, an assistant professor at the University of Delaware told the Financial Times that there are few spare workers or production facilities left. 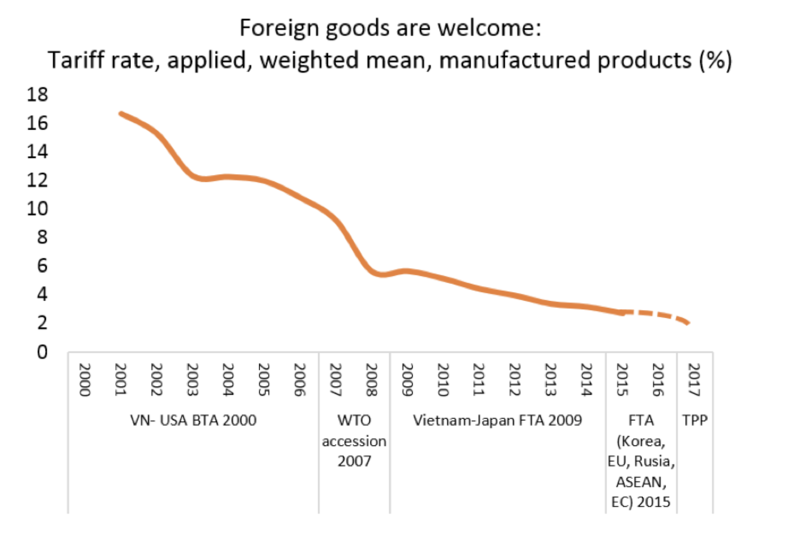 Regarding the first factor, the analysts point to the various free trade agreements Viet Nam has signed in the last 20 years. In 1995, Viet Nam joined the ASEAN free trade area. In 2000, it signed a free trade agreement with the US, and in 2007 it joined the World Trade Organisation. Since then, further ASEAN agreements followed with China, India, Japan and Korea, and just this year, the amended Trans-Pacific Partnership went into effect – albeit without the US. The cumulative effect of all these agreements was to gradually lower the tariffs imposed on both imports and exports to and from Viet Nam, as shown in the graph below. The government's drive towards an open economy also included domestic reforms. In 1986 the country created its first Law on Foreign Investment, enabling foreign companies to enter Viet Nam. Since then, law firm Baker & McKenzie said in a 2016 report, the law has been revised a number of times, mainly to adopt a more pro-investor approach while aiming to reduce administrative bureaucracy and better facilitate foreign investment into Viet Nam. Viet Nam’s efforts did not go unnoticed in international rankings. In the World Economic Forum’s Global Competitiveness Report, Viet Nam rose from 77th place in 2006 to 55th in 2017. In the World Bank’s Ease of Doing Business rankings, meanwhile, Viet Nam rose from 104th place in 2007 to 68th place in 2017. Last year, the Bank said, Viet Nam made progress on everything from enforcing contracts, increasing access to credit and electricity, paying taxes and trading across borders. Finally, Viet Nam invested a lot in its human capital and infrastructure. Facing a rapidly growing population - it stands at 95 million today, half of whom are under 35, and up from 60 million in 1986 – Vietnam made large public investments in primary education. This was necessary, as a growing population also means a growing need for jobs. But Vietnam also invested heavily in infrastructure, ensuring cheap mass access to the internet. The Fourth Industrial Revolution is knocking on Southeast Asia’s door, and having a sound IT infrastructure in place is essential preparation. Those investments paid off. Armed with the necessary infrastructure and with market-friendly policies in place, Viet Nam became a hub for foreign investment and manufacturing in Southeast Asia. Japanese and Korean electronics companies like Samsung, LG, Olympus and Pioneer and countless European and American apparel makers set up shop in the country. By 2017, the Financial Times reported, Viet Nam was the largest exporter of clothing in the region and the seconder largest exporter of electronics (after Singapore). Economic growth followed suit. Since 2010, Viet Nam’s GDP growth has been at least 5% per year, and in 2017 it peaked at 6.8%. With such rapid economic growth, the country grew from one of the poorest countries in the world to a comfortably middle-income one. Whereas its GDP per capita was barely $230 in 1985, it was more than ten times that in 2017 ($2,343). Corrected for purchasing power, it stands even higher, at over $6,000. Importantly, the economic growth was fairly inclusive. According to the World Economic Forum’s Inclusive Development Index, Viet Nam is part of a group of economies that have done particularly well at making their growth processes more inclusive and sustainable. Women too, fared better. Their employment rate is within 10% of that of men, notes the World Bank, and women-led households are less likely than those led by men to be poor, although inequalities remain. One important downside, however, is the government’s approach to human rights and privacy. Press freedom is one of the worst in the world, citizens are increasingly surveilled online, and human rights activists not welcome. As an example, two human rights activists invited to this year's World Economic Forum on ASEAN were denied a visa to enter the country. Could anything stop Viet Nam’s ascent? 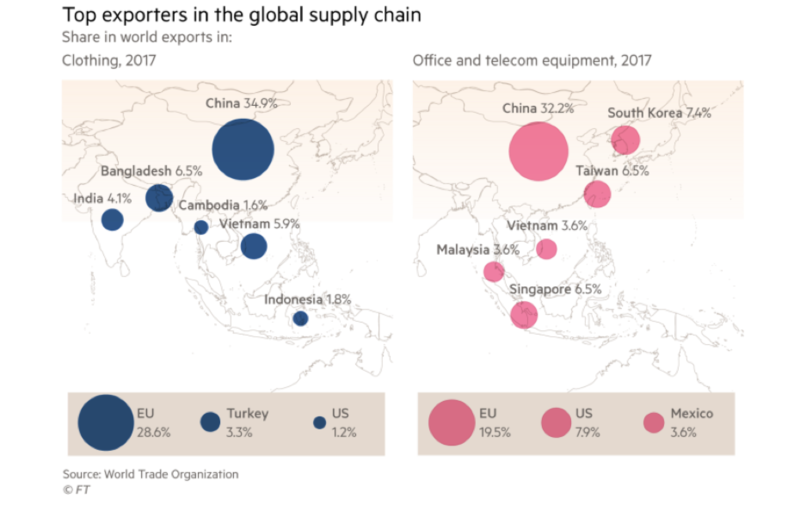 With the appetite for globalization on the wane in many parts of the country, Viet Nam looks particularly vulnerable, as the Financial Times reported earlier this year. Its exports are worth 99.2 per cent of its GDP, and as shown previously, much of its success is based on foreign investment and trade. As an emerging market, it may also fall out of favour as a place to invest in because of the strengthening dollar. But for now, Viet Nam looks to profit from rather than be hurt by increasing global trade tensions. Although the US has backed out of the Trans-Pacific Partnership, its antagonism so far has had a greater impact on China than on Viet Nam. The US government slapped imports on hundreds of billions of dollars’ worth of Chinese products, which has led companies with a manufacturing site in China to consider relocating to countries like Viet Nam.